On a cold but sunny Sunday I finally went to the West Village in New York to get the true ‘Friends’ feeling. The buildings there really make you feel like you are in New York –just in case going to the Empire State Building didn’t-. I also saw the building where Monica's apartment was in the show and as a person who has watched all 10 seasons a million times it was a real pinch me moment to be there. Now Sunday in NYC is known as a busy day brunch wise. All New Yorkers go out for their pancakes, bacon, eggs and smoothie bowls and I was simply not prepared for how busy it was everywhere. I basically walked from spot to spot to see if there was not a queue somewhere and that's where I entered The Wild Son: a cute and cosy café in the Meatpacking District. When I went inside I already saw an empty chair at the window which is honestly my favourite spot when eating alone -one word: people watching!- I settled myself and had a look at the menu. Even though they had a lot of yummy things I could only order one thing and in the end I went with pancakes. I kind of have an obsession with ordering anything sweet for breakfast, like waffles, French toast, smoothie bowls and… pancakes. 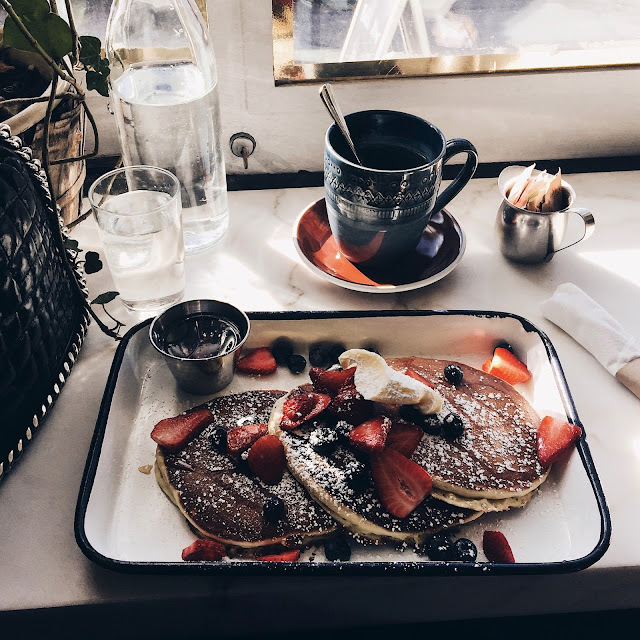 When discovering this café on Instagram the pancakes also looked amazing, so I ordered a tea -again classic me- and the Insta worthy buttermilk pancakes with berries. The Wild Son is everything you want in a café. It looks super cosy, the staff was friendly and the food was reasonably priced too. Besides the fact that it was still very busy, the food arrived fast, and I was just thinking about my time here in New York as I demolished those fluffy carbs and saw the people crossing the street outside. Now I've eaten a lot of pancakes in my life, but these ones have to be in the top 3, because oh my, those were good. The fruit, the syrup and the pancakes obviously were perfect and I ate it all. The Wild Son is perfect for eating alone, eating with friends or even to catch up with your parents. It has that cool New York City vibe, is packed with locals and really close to the High Line. Perfect for a walk after all those fluffy pancakes! Have you ever been in NYC? What is your favourite brunch place?